Something else on fixcel records: Poetry and Music! What could explain the emergence of a CD appearing on an acknowledged Jazz label that only marginally has anything to do with Jazz? 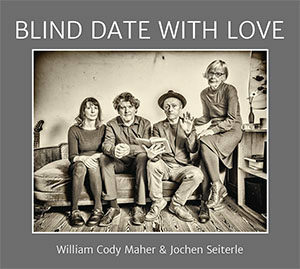 Is it simply the authenticity of the two artists William Cody Maher and Jochen Seiterle. Or maybe the way Maher delivers his spoken text in a Jazz like manner bringing it to life. Or the nuanced interaction between the two artists? In the end it doesn’t matter. It works! As all great writers do, Maher is able to create moods and images that seduce the reader or listener’s imagination. His characters and scenarios are equally individual as well as being archetypical. The literary autobiographical alter ego of the author not only shimmers, but is constantly present in his creations. Rarely are the results joyful, though his laconic and ironic wit and his ability to view the world and its protagonists and situations from the outside provides an absurdist comic relief. In the track „Against the War“ he is on the way to a demonstration against the Vietnam war and finds himself stranded in the middle of nowhere with his protest sign he stands defiant and resigned to his fate, or in the satirical track „Gone and Dead“ he feels lucky that being a non-swimmer he survived the collapse of a waterbed in his VW Bus on his way to Woodstock, while disputing Dylan’s claim of being „forever young“ evidenced by his own hair loss. He brings it all together through Jochen Seiterle’s exceptionally subtle arrangements. Seiterle is one of these guitar wizards that feels at home in all musical genres. On the track „Dust Off My Dancin‘ Shoes“, with some loose guitar picking he conjures up an authentic Americana feeling, or in „Rockin‘ The House“, with some blistering Blues chords, he imposes a menacing threat hanging over the warped shack of Maher’s childhood. His sensitive and expressive sound sculptures provide a living ambience for Maher’s texts. ..is American, comes from San Francisco and roams the world as a Performance Artist und Poet, sometimes as an actor, his suitcase filled with Lyrics.“ (DeBug). Once again he has arrived in Berlin, after taking a breather in Heidelberg for some years ever dragging his suitcase filled with lyrics along with him – the fantastic CD „The Suitcase“ produced by Frank Pyne in collaboration with a wide range of musicians (unfortunately no longer available) or the text „Human Being“, basis for the dance theatre production entitled BEING HUMAN BEING choreographed by Anthony Rizzi, and his two volumes „Geisterstadt“ and „Spielsachen“ with dialogues, texts and poems, translated by Walter Hartmann and Carl Weissner. published by the Engstler Verlag). Studied with John Stowell, USA, 1995-2001.